A British music supergroup teaming Bernard Sumner of New Order with former Smiths guitarist Johnny Marr, Electronic was more of a cult item in the US as opposed to the total embracing the UK gave it. No wonder. Taking its cues mostly from New Order, the duo did all the programming and songwriting, emphasizing electro-style dance music with acid house touches. Their debut album opened with Marr's distorted wah wah to the disco beat of "Idiot Country," followed by song after song of distinct high hat patterns mixed up front and layered with synths. Electronic follows in the tradition of solo projects veered into successful partnerships, the most famous one being when Kenny Loggins "sat in" for Jim Messina's solo album in the early 70's, resulting in a string of hit albums together. Vocalist Sumner had planned a solo album, asked Marr to join him, and together they produced three albums over an eight-year period. 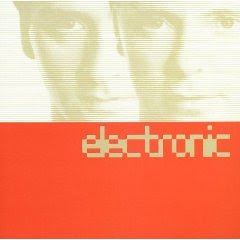 What really made Electronic's debut special were their two collaborations with the Pet Shop Boys' Neil Tennant and Chris Lowe, "The Patience of a Saint" and especially "Getting Away With It." The latter was a single released in 1989, well ahead of the full 2001 album, and it's a shame Tennant and Lowe didn't do the whole album with them. Now that would have been a super-super group and one wonders what that combination of talent would have been on an ongoing basis. "Getting Away With It" is equal doses of all the brilliant talents involved -- Sumner's emotionally bleak lyrics, Marr taking a rare guitar solo, Neil Tennant's background vocals mixed at the same levels as Sumner's, and a polished melody that could only come from the pop skills of the Pet Shop Boys. Primed by the organic combo of an actual electric bass and an acoustic piano pounding out the chords, "Getting Away With It" glides on a mid-tempo bed of strings, surging with bells on the chorus (a Pet Shop Boys arrangement trademark) and Marr's lovely acoustic guitar solo. I remember that after the time of this single, Marr contributed another wah wah rhythm guitar to the Pet Shop Boys' incredible decade-introspective single "Being Boring" from their album Behaviour. For appreciators of sophisticated electro-pop, if you are a fan of New Order and Pet Shop Boys especially, you want to track this debut album down for a cheap used copy. With New Order currently broken up, it's hard not to wish Sumner would find himself with Tennant and Lowe and cut a whole album together.